O! How I love time spent south of the salt line in December! We were all doubtful that I’d be able to see my friends Deb and Jeana Brunson in Fairhope this year but they arrived in town on Thursday, my last day at The Grand, from Las Cruces, New Mexico, and Tallahassee, Florida, respectively. We gathered for afternoon tea at The Grand with Deb and Jeana, their brother Richard and his wife, Allison, and Allison and Richard’s dapper youngest son, William, who insisted on wearing a tie for tea at The Grand. I helped him tie the tie and commented that with his blue blazer, button-down shirt and tie, and khakis, he looked like an Alabama frat boy headed to a game. All of the Brunsons had a Christmas concert to attend but Deb, Jeana, Allison, Richard, and I met later for a memorable meal at Dragonfly Foodbar in downtown Fairhope. During dinner, I mentioned that I was out of Mardi Gras beads and Allison and Richard insisted that I stop by their house and get some of their stash. 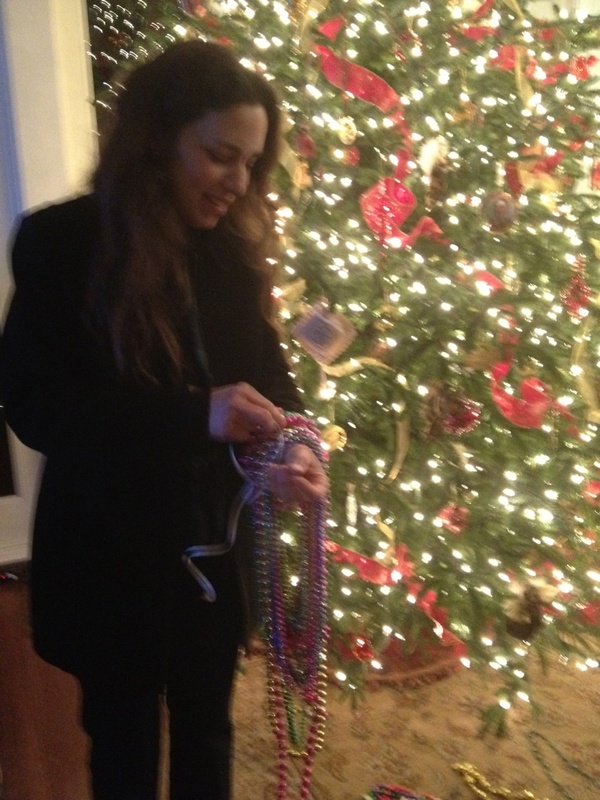 Later, at their beautiful home on Mobile Bay, Allison and Richard not only brought out a load of shiny beads from storage, but they also insisted on untangling them, separating them by size, and tying each bundle together before they loaded them into a huge box which should fulfill my Mardi Gras bead needs for a while. 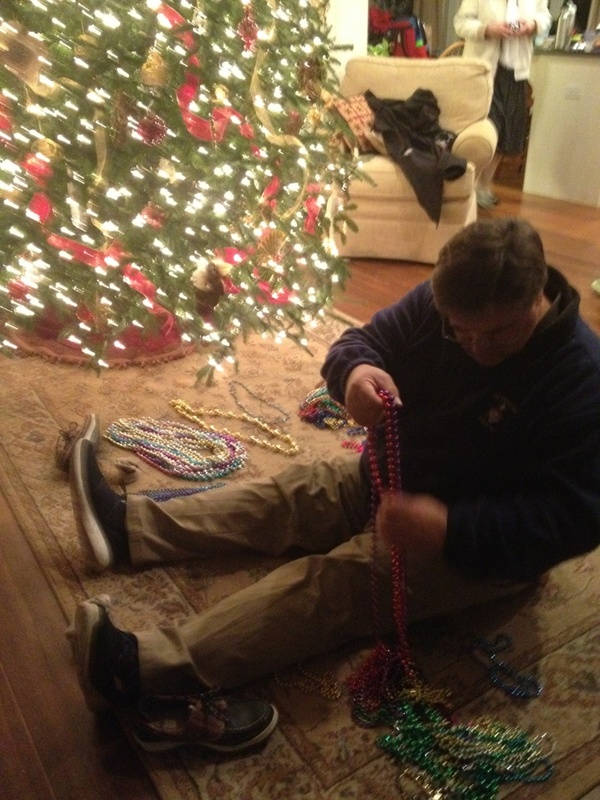 It is a true friend, I realize, who will sort and tie your Mardi Gras beads. As I headed north from Point Clear on Friday, I realized that it was December 19 and I had not photographed any churches for my 2015 Christmas card. Realizing that there was still plenty of time and that there were a couple of back-up buildings I might use in north Alabama, I decided to keep my eyes open for any Christmas card-worthy churches along the drive home. In an earlier post for this journal, I recount my criteria for my annual Christmas card designs. I look for buildings that are often vernacular, were photographed in the month of December, and are always honest. On this most recent trip, I had already taken photographs of Little Bethel Baptist Church in Daphne. 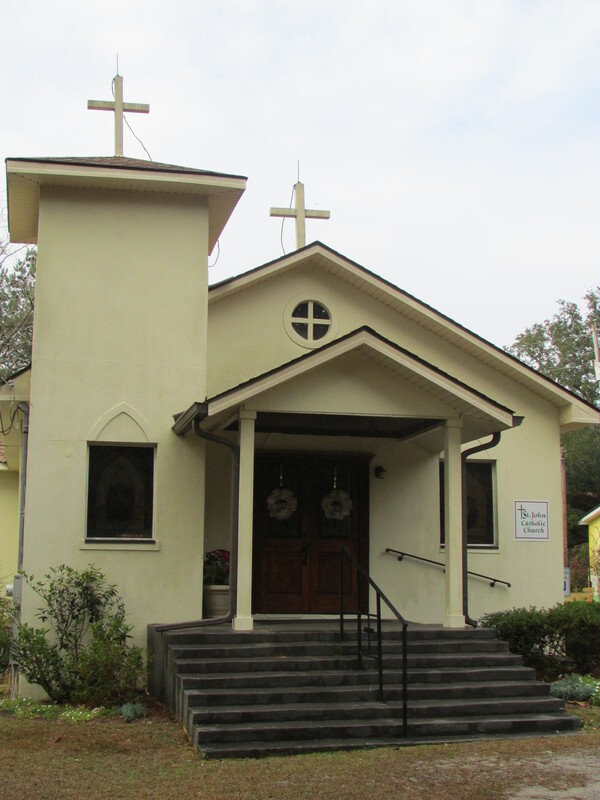 Traveling along Alabama SR 225 in rural Baldwin County, I decided to check out St. John’s, a small yellow Catholic chapel that I had passed many times before but never photographed. As I pulled away from St. John’s, I noticed a small white building through the trees. 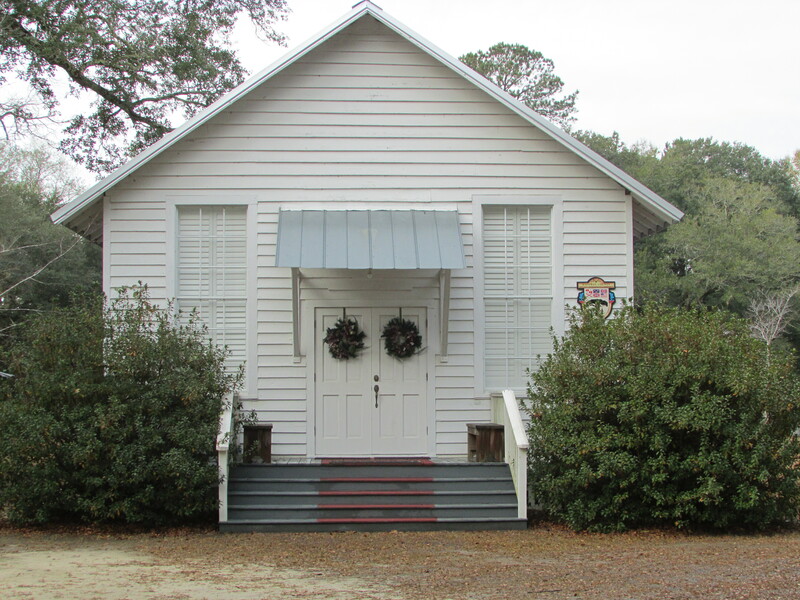 I pulled off the road again and discovered what looks like a former schoolhouse that is now designated as “James E. Cook Memorial Presbyterian Chapel.” It is a charming little church I had never before noticed. A few hours later, approaching Montgomery, I remembered the small town of Lowndesboro off U.S. Highway 80 between Selma and Montgomery. Highway 80 from Selma to Montgomery has been designated by the National Park Service as the “Selma to Montgomery National Voting Rights Trail,” a national scenic byway. Turning off 80 onto CR 29 into Lowndesboro, one travels through an impressive and well-maintained collection of antebellum architecture compressed into a very brief stretch of road. I have been to the town several times now, but it is always a shock to see such pristine examples of domestic and non-secular architecture in such a compact little community (population 140). A particular oddity among the roadside attractions of Lowndesboro is the C.M.E. church, erected around 1830. 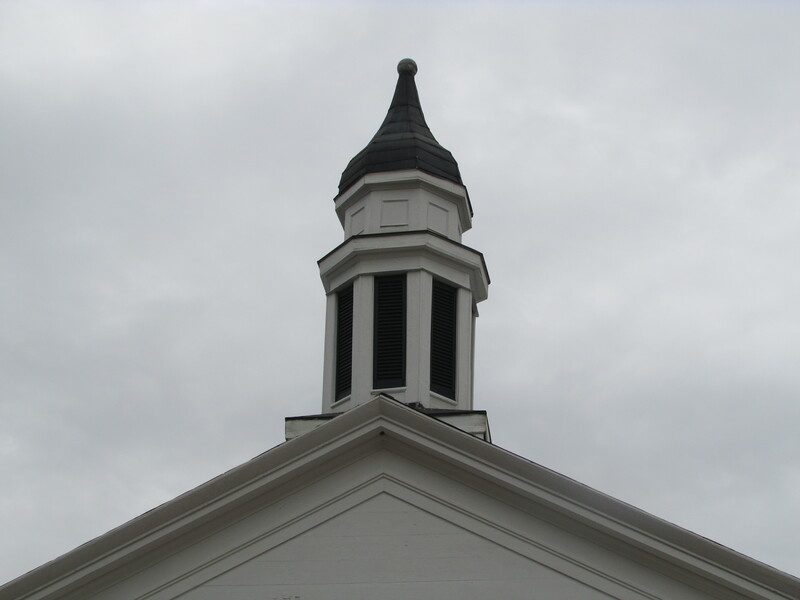 Instead of a traditional steeple, the building is topped by a structure which was the original dome of the first Alabama state capitol in Cahaba. 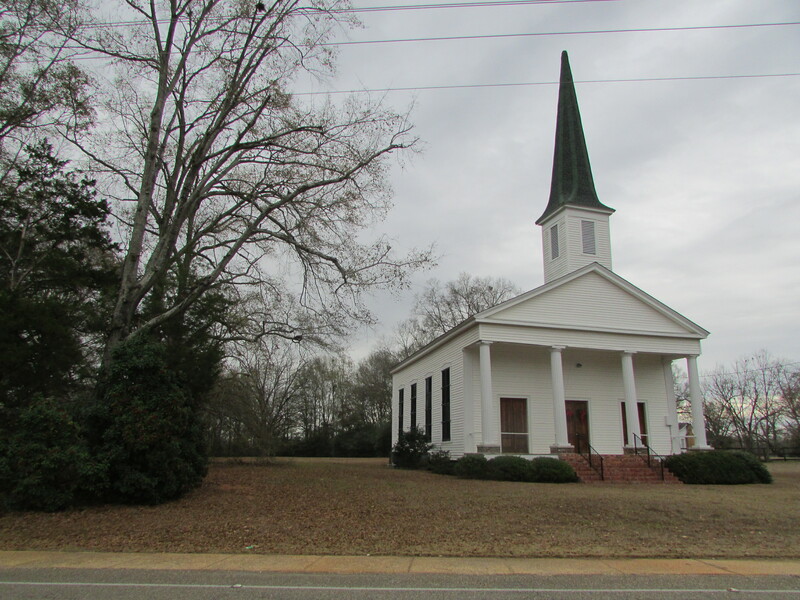 It was moved to Lowndesboro and mounted on the church when the original capitol building in Cahaba was demolished. St. Paul’s Episcopal is a stately and dignified structure. Lowndesboro Baptist has intricate Carpenter Gothic detailing in the wooden columns on its portico. 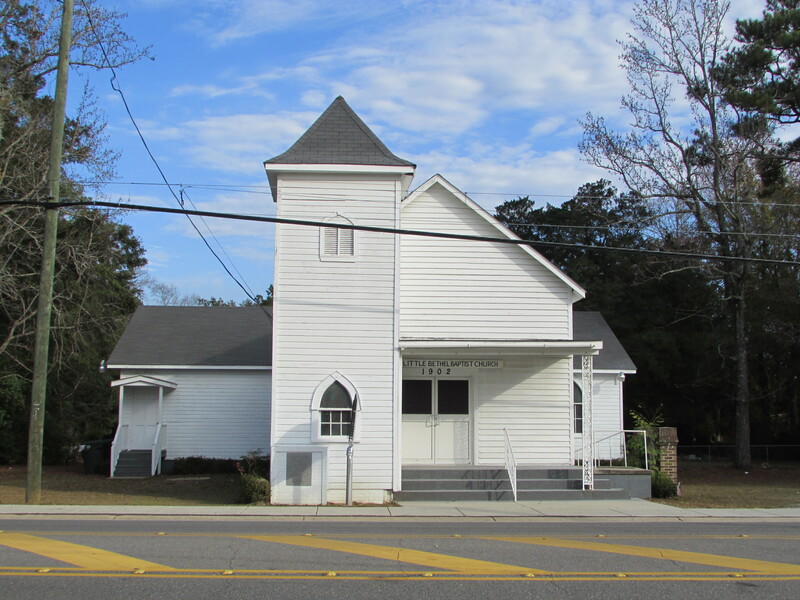 Lowndesboro Presbyterian (pictured at the front of this post) has simple Doric columns. The only one of the impressive old churches that did not make the cut was Lowndesboro United Methodist. The main structure is very handsome but I couldn’t get past the steeple, which just couldn’t quite live up to the building’s base. Alabama-native writer Eugene Walter, who was quoted in an earlier post, referred to such steeples as “little-prick.” I now regret not taking a picture of the building, since it was a lovely church (other than that unfortunate steeple) and I likely won’t be back in Lowndesboro for a while. 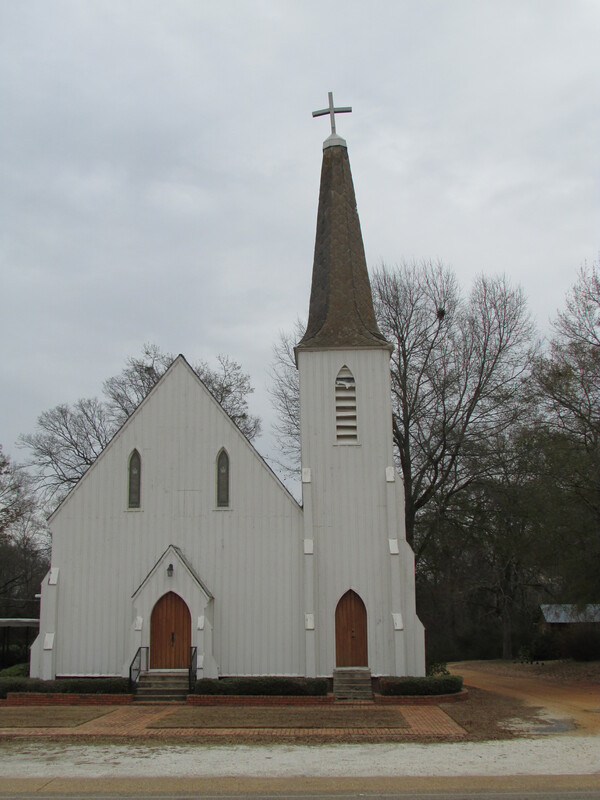 Lowndesboro was a treasure trove in my search for picturesque churches. After roaming the street and photographing for about an hour, I drove away with the certainty that I have now found my Christmas card image for 2015. The challenge will be choosing just one out of many. A playwright friend recently sent a note from Los Angeles and said “it isn’t Christmas at our house until your church arrives!” It is because of such kind words from many friends and correspondents that I take particular pride and effort in my December sojourn to photograph churches and other images of the season throughout Alabama. 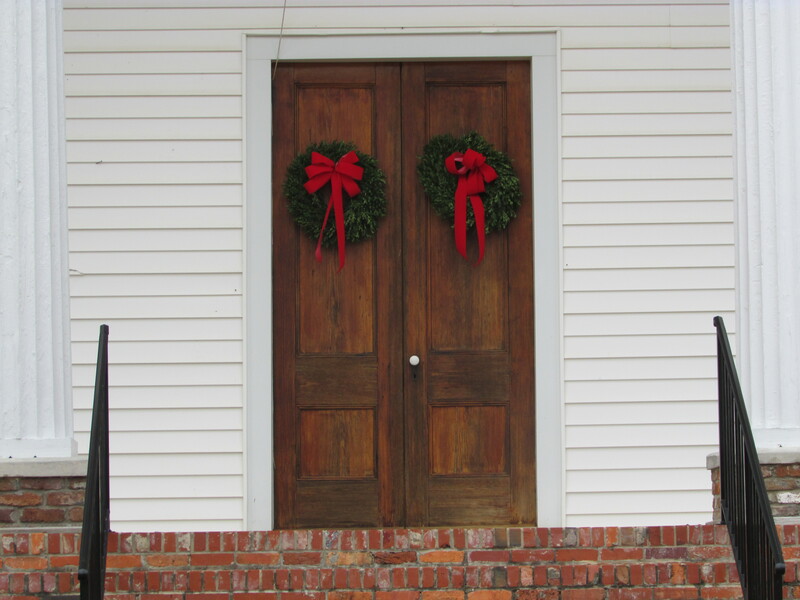 This entry was posted in Alabama, photography, the south and tagged Alabama, architecture, church architecture, Lowndesboro, the south, travel on December 23, 2014 by gedwardjourney. 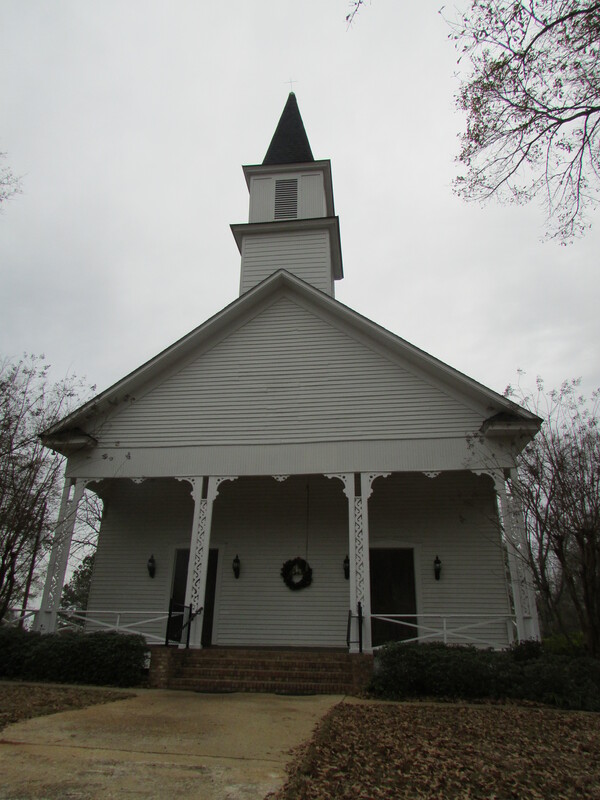 Mr. Faulkner, That is Lowndesboro Presbyterian Church in Lowndesboro, Alabama, erected 1850. I mention that later in the essay but apologize for my lack of clarity.